We read with considerable interest the paper by Sheil et al (Gut 2004;53:694–700) who reported the successful application of the subcutaneous route for probiotic attenuation of colitis. We agree with the corresponding commentary of Ghosh et al (Gut 2004;53:620–2) regarding the need to study mechanisms underlying probiotic interactions. Recently, we further standardised a method to compare the anti-inflammatory potential of orally administered lactic acid bacteria (LAB) in a murine model of acute 2,4,6, trinitrobenzene sulphonic acid (TNBS) induced colitis.1 This model allowed us to discriminate “protective” strains, showing between 30% and 70% reduction of inflammatory score, from strains which did not significantly attenuate experimental colitis. We could select highly performing strains of Lactobacillus salivarius and Lactobacillus rhamnosus that consistently lowered colitis. In comparison, a strain of Lactobacillus acidophilus, Lactococcus lactis, and Streptococcus gordonii never showed any improvement. For all five strains, we investigated the protective effect of a single intraperitoneal injection of 5×107 live microorganisms, 24 hours prior to induction of colitis. Surprisingly, protection by the LAB strains via this systemic route closely matched the efficiency of the oral route (fig 1). Lactic acid bacteria (LAB) protection on macroscopic damages induced by 2,4,6, trinitrobenzene sulphonic acid (TNBS): the impact of the oral or intraperitoneal route of LAB administration on reduction of TNBS induced colitis in mice. Results are expressed as per cent reduction of mean macroscopic inflammation7 of mice treated with LAB, in relation to the mean score of non-treated mice. Colitis index was assessed 48 hours after TNBS administration. 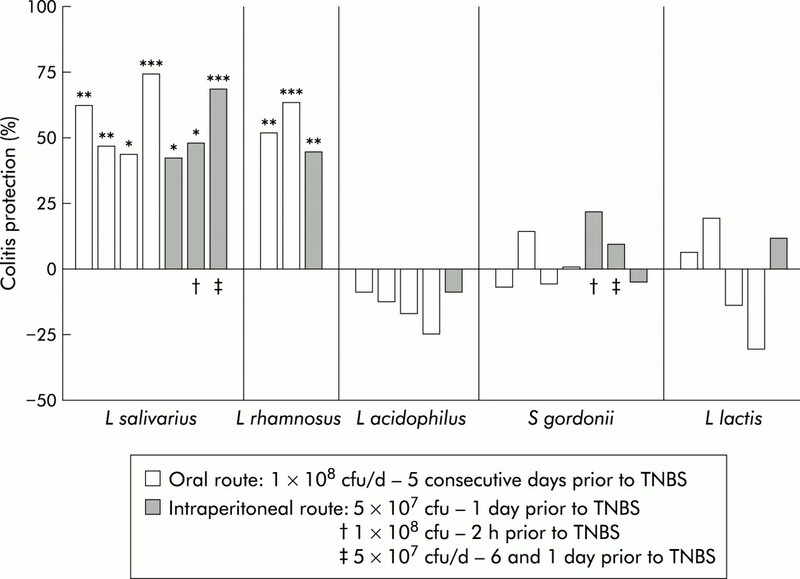 Each bar represents an independent experiment of control (n = 10) and LAB treated mice (n = 10). *p<0.05, **p<0.01, ***p<0.001, significantly different from the corresponding TNBS control group (Mann-Whitney U test). CFU, colony forming unit; d; day. When evaluating both routes simultaneously, the anti-inflammatory effect was of comparable magnitude. Moreover, the prophylactic impact of the intraperitoneal Lactobacillus salivarius strain was established up to two hours before TNBS administration. It is noteworthy that two delayed injections could lead to protection but caused marked weight loss (23% (p<0.05) v 15% and 11%, respectively, for control and oral route groups) with alleged fever. As emphasised by Gosh and colleagues (Gut 2004;53:620–2), approaches involving fractional studies are essential tools to complete the knowledge obtained from in vitro and ex vivo models and assist in understanding the interactions between LAB and the immune system. These studies may reveal common mechanisms active in inflammation, tolerance, and allergy models. Even if this study confirms the importance of the systemic route for certain probiotic activity, we cannot neglect the possible influence of local and innate immunity, the general status of the gut flora, and the role of epithelial cells in the cross talk between both. We are indebted to Danisco France for financial support. Foligné B, Nutten S, Steidler L, et al. Potentialities of the TNBS-induced colitis model to evaluate the anti-inflammatory properties of lactic acid bacteria. Dig Dis. (in press). Pereyra BS, Falcoff R, Falcoff E, et al. Interferon induction by Lactobacillus bulgaricus and Streptococcus thermophilus in mice. Eur Cytokine Netw1991;2:299–303. Mercenier A, Pavan S, Pot B. Probiotics as biotherapeutic agents: present knowledge and future prospects. Curr Pharm Des2003;9:175–9. Obermeier F, Dunger N, Strauch UG, et al. Contrasting activity of cytosin-guanosin dinucleotide oligonucleotides in mice with experimental colitis. Clin Exp Immunol2003;134:217–24. Reid G, Guarner F, Gibson G, et al. Discussion on toll-like receptor 9 signaling mediates the anti-inflammatory effects of probiotics in murine experimental colitis. Gastroenterology2004;127:366–7. Wallace JL, MacNaughton WK, Morris GP, et al. Inhibition of leukotriene synthesis markedly accelerates healing in a rat model of inflammatory bowel disease. Gastroenterology1989;96:29–36.